Perhaps Alfred Hitchcock’s most unusual film, 1948’s Rope was his first color flick. However, that’s not what makes it so different. Hitchcock essentially told the tale in real time and used a series of uninterrupted takes welded together via subtle cuts. Why’d they do it? To prove they could, basically. They wanted to commit “the perfect crime” as an experiment. This leaves Phillip unsettled, but Brandon seems completely unaffected by the murder. In fact, he rides a high via the smoothness of the whole event and the feelings of power that come as well. As cocky as could be, Brandon throws a party right after the murder to act as a finishing touch to their “work of art”. This brings in some of David’s relatives as well as Rupert Cadell (James Stewart), a former teacher of theirs. The movie follows the dinner party and the suspicions that crop up as it proceeds. 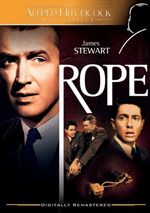 Hitchcock dealt with murder in many of his flicks, but Rope looks at the subject in an unusually cynical and dark manner. Inspired by the infamous real-life crime of Leopold and Loeb, it doesn’t present killing as a means to an end. It shows the deed as a lark committed by two “superior beings” who just want to prove their greatness. Actually, it’s probably a mistake to stick such self-aggrandizement on Phillip, as it seems clear he follows Brandon’s orders and doesn’t take pleasure from the act. Brandon presents the real amoral, arrogant monster here, a product of too much privilege and some distorted interpretations of various teachings. Stewart wasn’t the filmmakers’ first choice to play Rupert, but I believe he represents inspired casting since the part is so unusual for him. When we think of Stewart, we come up with warm ‘n’ fuzzy roles like George Bailey or Jefferson Smith. We certainly don’t conjure an image of cold-hearted cynics who see no crime in the elimination of society’s less successful members! That twist makes Stewart a gem as Rupert. Within his “everyman” hands, the concepts become more chilling. It doesn’t seem disturbing to hear a smug blue-blood such Ben Affleck look-alike John Dall to make such pronouncements, but when professional Nice Guy Stewart starts down that vaguely Nazi-esque line of thought, matters become more troublesome. As I noted at the start of this review, Rope provided unusual cinematic techniques. These should have backfired, but they work perfectly well. Two dangers existed. First, since the movie adapted a one-act stage production, it easily could’ve felt like… well, like a filmed version of a one-act stage production. Not counting an opening shot that establishes the location, the flick never leaves the confines of Brandon’s apartment. Rope boasts too much cinematographic inventiveness to suffer from its inherently limited setting. The camera remains in nearly constant motion, though not in a distracting, hyperactive Michael Bay sense. Instead, it follows the characters to highlight necessary plot points and relationships. The camera also creates tension via perspective. For instance, when the dinner ends and maid Mrs. Wilson (Edith Evanson) cleans the leftovers off the trunk, the camera settles to follow her work. It totally ignores the conversation among the rest of the guests; we hear them speak but solely watch Mrs. Wilson, even though she often gathers materials at a distance. Since we know what’s in the chest – and that she soon plans to open it to store books in it – this perspective ramps up the drama. It’s a clever method that fits the film well, and the rest of the camera work seems just as good. The other potential pitfall comes from the sheer pretentiousness of the concept. When someone makes a flick that essentially runs in real time and that never overtly cuts, the result finds it nearly impossible to seem like anything other than an irritating experiment. 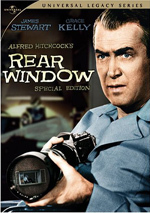 However, Hitchcock wasn’t the sort of director who made a movie solely for its cinematic novelty; he was too cognizant of story and entertainment value. That means Rope usually doesn’t call attention to its techniques. If you aren’t aware of the methods before you see it, you probably won’t realize they’re in use. Yes, some of the cuts seem goofy; Hitchcock usually stages a close-up of a character’s back to create a virtual black screen and allow an unnoticed edit. The images created by the zooms feel somewhat unnatural; they wouldn’t normally occur in a film, so their presence here puts us on alert that something’s up. Nonetheless, they pop up infrequently and probably wouldn’t be as distracting if I wasn’t aware of them. Most of the edits move smoothly, and the movie progresses well. We become too wrapped up in the story to concern ourselves with cinematic techniques, really. The methods add to the tension and come without much of a negative price. Okay, I will admit that one part of the real time concept doesn’t work for me: this seems to be an awfully short dinner party. From the killing of David to the end of the gathering, the movie only covers about an hour. How many parties last a mere 50 minutes or so? Usually the guests would still be on cocktails by the time this flick sends them home! Rope appears in an aspect ratio of 1.33:1 on this single-sided, double-layered DVD; due to those dimensions, the image has not been enhanced for 16X9 televisions. Despite a few nagging concerns, much of the flick looked good. Given the movie’s age, it should come as no surprise that source defects created the majority of the transfer’s problems. While much of it passed without flaws, a few too many occurred. I noticed occasional specks, marks, streaks and blotches. Though not constant issues, these were the primary reason the image fell to a “B-“. Definition also was positive. Some wide shots – which also occurred infrequently – could be slightly soft, a factor exacerbated by light edge enhancement. Nonetheless, most of the flick seemed crisp and concise. No problems with shimmering or jagged edges arose. Though I didn’t feel comfortable with a grade above “B-“, I still thought the movie seemed attractive. As for the monaural audio of Rope, it proved perfectly competent. Virtually no score accompanied the action; other than Phillip’s piano playing, music popped up only during the opening and closing credits. Speech dominated the flick, and the lines seemed acceptably natural and clear. Effects played a pretty minor role, but they proved reasonably accurate, and the occasional louder bit lacked distortion or flaws. No background noise marred the presentation. This became a serviceable mix. A few extras fill out the package. A documentary entitled Rope Unleashed runs 32 minutes, 27 seconds and includes movie snippets, archival elements, and interviews. We get remarks from director’s daughter Pat Hitchcock O’Connell, collaborator Hume Cronyn, screenwriter Arthur Laurents, and actor Farley Granger. 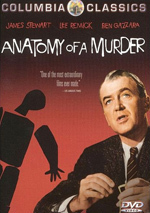 We get notes about the screenplay and the adaptation of the original play, censorship concerns and homosexual undertones, cast and performances, cinematic and editing techniques, Hitchcock’s style on the set and the film’s unusual technical aspects, the film’s trailer, and its reception. Two stillframe areas appear. Within Production Photographs, we get 45 images. These cover advertisements, behind the scenes snaps, and publicity pictures. Finally, text Production Notes offer some basics about the flick’s origins and creation. Most directors who attempt real time movies without obvious cuts would make their works unbearably stilted and pretentious. Alfred Hitchcock wasn’t “most directors”, though, so his use of unusual techniques in Rope does much to benefit the drama and little to harm it. The DVD provides pretty good picture and audio along with supplements highlighted by a very interesting documentary. This ends up as a fine movie and DVD.